<posted May 10, 2015> It's Mother's Day today and what a day it has been. Spring seems to have come and gone over the span of a weekend and as the temperatures climb near the 80's, the garden is taking off. Today I planted the two large planters at our Village hall with a bright mix of foxtail fern, spider plant, geraniums and creeping jenny. I threw some vinca in there for spilling interest. I think I'll really like this foliage combination and hope that visitors to our Village Hall will enjoy them, too. Our old building has so much character. Then I was off to the Community Park where I am expanding the rain garden with a large swath of daylilies, both registered cultivars and promising seedlings. It is a LARGE expansion, that will hold about 300 daylilies by the time I'm done. It helps that I was the director of Parks and Recreation for our Village for the last year, and I thought it quite a reward that it was approved to expand on what the Girl Scouts had already started with their small rain garden. Many people will get to see daylilies outside of fulva and Stella, and I hope it is a legacy garden for years to come - maybe even a fundraiser for the park as plants need dividing. Here is a photo of it in early April when David and Donna Williams donated their seedlings to my project before their move to Tampa - and really kicked off the inspiration for this entire project. All of these pots have now been emptied, organized and inventoried. The rain garden (the large winter-weary brown splotch in the front of the photo) has been cleaned out and the plants are green and flourishing now. Some are even in bloom! Ill post pics for you soon so you can see its progress. The large front loader will come this week and scrape the grass where I have laid out the beds-to-be. 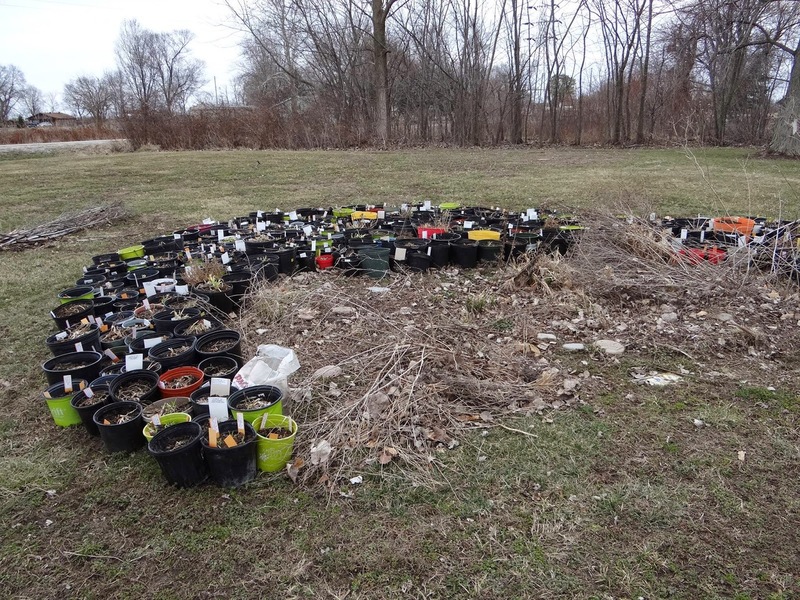 Some of these potted plants did not make it through the winter, but the dirt was used for other plantings and the pots were recycled to good use. I've moved many 20+ fan clumps of my own promising seedlings out here, too, and cannot wait to see them stretch in the sun. The phased plan includes benches, butterfly-attracting perennials and even a few flowering trees. Every village needs a large flowering garden where residents can discover flowers and pollinators and good smelling stuff and I'm doing my part to bring one to my own village. It is a lot of work, on my own dime and sweat, but worth every drop of it all. The spark for this post today came as I moved some of those potted seedlings around and noticed the crosses on some of them. What was I thinking when I made that cross or bought that seed? What am I expecting? 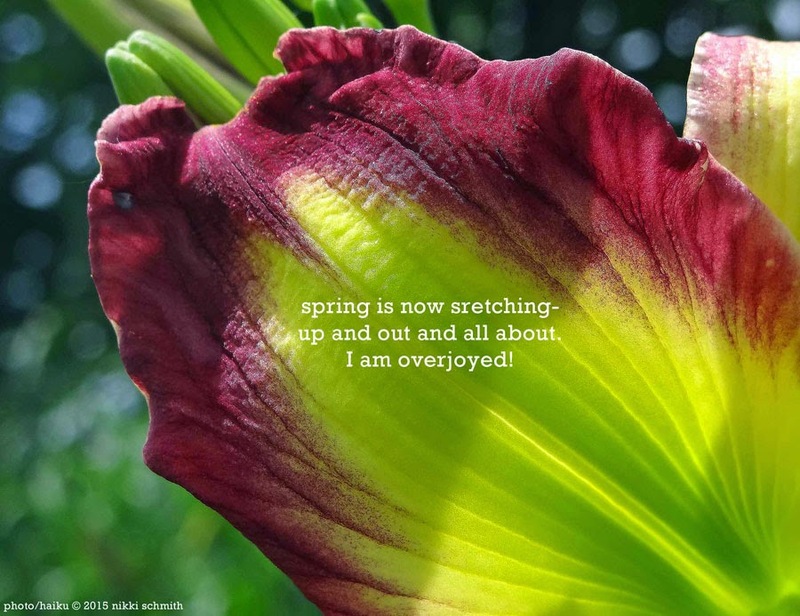 How will it contribute to the already over-populated daylily landscape? What is missing in the universe's daylily toolbox? Is it patterns on a form and plant base like MARGO REED INDEED (below)? Is it a wildly splashed black eye on a form and plant base like ORANGE VELVET(below)? What about keeping the form and plant habit of BROOKWOOD WOW and add serrated teeth to it (below)? True pioneers do not try to make what already exists better, they strive to create something new. Breakthroughs that contribute the most to the community are those ideas that are different from ones we already know. Don't get me wrong, current ideas (and ideals) should always be improving and growing and stretching - but, the moments that occur when something new emerges and functions are the golden ones. Almost anyone can observe something and evolve it. With today's 24-hour news-cycle and the ability to one-click share your ideas with everyone you know, ideas and inspiration spread faster than soft, Thanksgiving butter. You gotta reach out and grab your piece of the bandwidth. I don't know what it is, and there are surely hundreds of hybridizers out there trying to make a name for themselves either on their own sweat or that of others, but I'm sure looking for it. Searching for what stands out - what talks to me - what makes the garden better for including it. What do you envision as different? As new? As better? P.S. if you ever wanted to know what is the perfect outfit for touring, that lady in the pic at the beginning of this post is wearing the example of what you should wear while on a bus tour. 1. Layers. 2. Hat. 3. Sunglasses. Thanks, Renee! Good to hear from you here...thanks for stopping by! Tell me more about the rain garden. What is the purpose of a rain garden - is the purpose to catch run off? The rain garden is built in a "depressed" or "concave" area and it is strategically placed to catch run off and water itself. It is planted with a great mix of perennials that handle drought and sometimes boggy conditions. Its not super-concave, just a small, rolling grade. Usually, it is a small garden which is designed to withstand the extremes of moisture and concentrations of nutrients, particularly Nitrogen and Phosphorus, that are found in stormwater runoff. rain gardens are sited ideally close to the source of the runoff and serve to slow the stormwater as it travels downhill, giving the stormwater more time to infiltrate and less opportunity to gain momentum and erosive power. On the surface, a rain garden looks like an attractive garden. It may support habitat for birds and butterflies, it may be a formal landscape amenity or it may be incorporated into a larger garden as a border or as an entry feature. What makes it a rain garden is in how it gets its water and what happens to that water once it arrives in the garden. Hey, Katy! The trick I found is to find a project that is already in the works, or already completed and expand on that. Sometimes people cant see the vision if its "starting from scratch." Next project- cemetery entrance and flagpole plantings. Someday my little Village will be a "Daylily City!"